We promised her that we wouldn't go crazy with a theme but make sure the little one had plenty of fun. This Olaf balloon was perfect. Cupcake loves balloons but we rarely have them because of the ceiling fans. This one I weighted down so that it just barely hovered over the ground but still followed her wherever she went. Our printer has been on the fritz and acting a little bi-polar. Sometimes it wants to PRINT ALL THE THINGS and other times it prints half a page and stops. Anyway, I wanted to make a birthday banner so I pulled out the snowflakes we made over Christmas (that I had saved in a file folder) and Rain helped me add some letters that spelled out "Happy Birthday" on both sides. It turned out really pretty and took all of about 10 minutes to make. We hung them at varying heights and they twirled in the breeze of the ceiling fan. 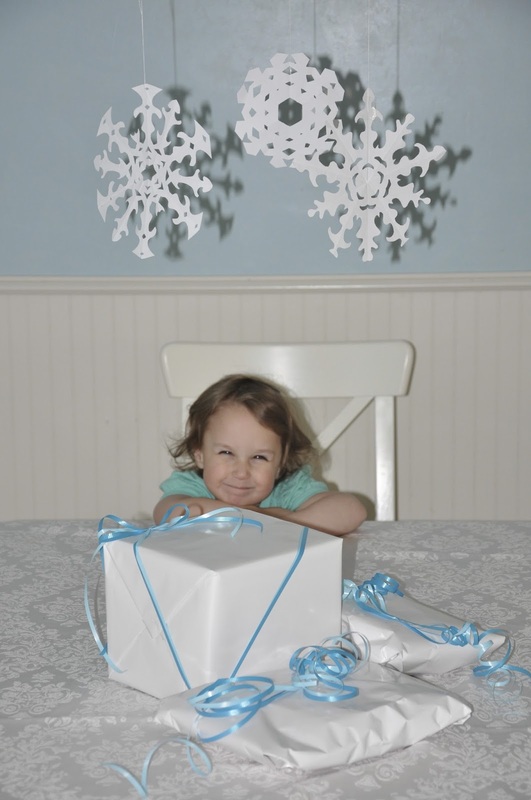 I used white paper and blue ribbons to wrap her gifts. We also added some blue and white streamers because it's just not a birthday to Cupcake if there are no streamers to run through! It's so hard when the presents aren't for you! She was delighted to help hand them to her sister though. Ice cream for lunch was a must! Her cake was a little challenging. I thought I'd make a beautiful white tiered cake with white frosting and candy ice. But she wanted Smitten Kitchen's Chocolate Peanut Butter cake… a very un-Frozen looking cake. So I decided to add a few white chocolate snowflakes using white candy melts and tracing these designs on some wax paper. I really thought they would be too delicate to make it off the paper, but only a few broke and I was still able to use them. Happy Birthday to our sweet, beautiful Sunshine! You truly are a ray of sunshine in our lives!